A family vacation is quite different from a regular vacation. It should be a balance between the parent's and the children's needs. Some families with teenagers enjoy adventure trips with lots of activities such as trekking, kayaking, and biking. 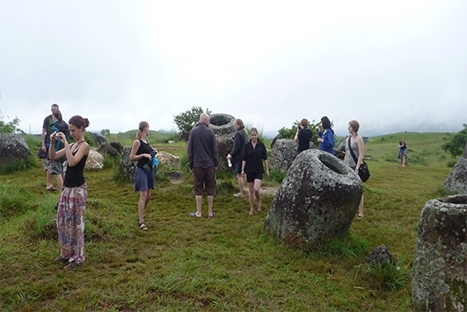 Other families like to combine their visit with educational and local touches, and then there are those with younger children who choose trips with lots of relaxing. What we can do for your family is very careful planning using high quality, child-friendly guides. 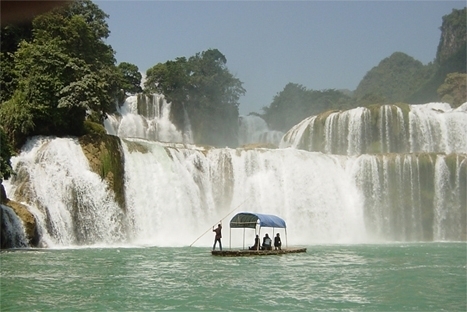 This is to ensure that you enjoy an exciting, memorable, and safe family holiday in Vietnam, Cambodia and Laos. Upon arrival in Ha Noi, your guide and private car will meet you and transfer you to your hotel. Vietnam’s quaint capital is a city of wide tree-lined boulevards, beautiful lakes, colonial buildings, wonderful museums, and rich culture. Ha Noi has much to offer, and you can’t leave it without wishing to have some more days (if not more) to explore this city of a thousand years old. Depending on your arrival time, you may see a water puppet show at Thang Long Water Puppet Theater on the same day. Even though water puppetry is considered to have originated in the Red River delta during the Ly Dynasty in the 11th century in Vietnam, it has really flourished in recent years. 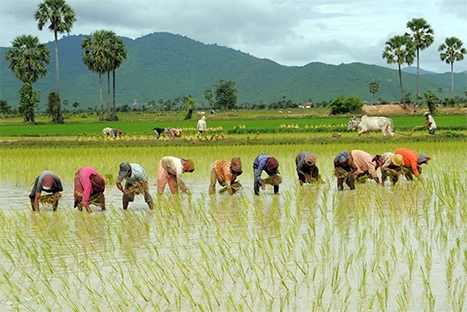 Some of the earliest groups were found in Nguyen Xa Commune, Dong Hung District in Thai Binh Province. 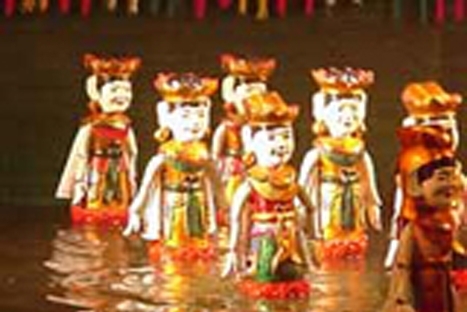 Some famous groups of water puppetry were also found in Hai Phong City, Hai Duong Province, and Dong Anh District in Ha Noi. If visiting the cradle of this art is on your list, Aurora can help you see any of the places mentioned. If you do not have that much time to travel, you can visit a famous artist family in the center of Ha Noi. After the show, you will stroll down to the old quarter and have dinner at Hanoi Little Restaurant. This 25 km loop including biking through many historical sites, beautiful lakes, gorgeous pagodas and temples, lovely streets, and etc., is an ideal way to explore Ha Noi. 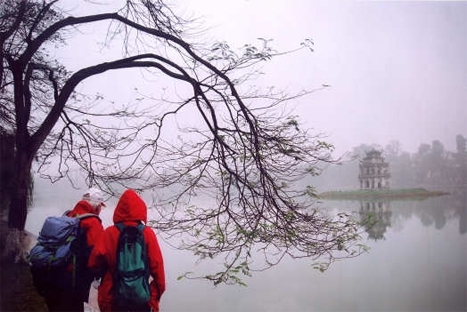 You will have good opportunities to touch the local culture and watch Ha Noi from a quiet side – West Lake. We will work hard to make sure a nice and safe trip with the least traffic for you. - Stop at Phu Tay Ho: The temple, perhaps the most popular place to worship in Ha Noi, was built in the 16th century to worship Mother Goddess, to whom the temple is dedicated. - See Buddhist pagodas such as Tao Sach Pagoda, Kim Lien Pagoda. - Stop for a cup of coffee and/or tea by the lake. You have now seen much of the west lake and some of the city of Ha Noi. There are some minutes for you to witness the beauty of the lake again. The west lake is also a place many national kayaking athletes use to practice for their next tournaments. - Admire beautiful Vietnam national flower – lotus if you are biking in Ha Noi in the summer. Your lunch will be served in a nice Vietnamese buffet restaurant. In the afternoon, our city tour will start with a visit to the Temple of Literature. In 1076, Quoc Tu Giam - Vietnam's first university - was established next to the temple to educate the children of the Vietnamese royalty, mandarins, and members of the elite. The university functioned for an incredible period of 700 years, and its gardens and well-preserved architecture offer a wonderful glimpse of Vietnam’s past. If you are lucky enough, you may meet a calligraphy master and have an opportunity to learn about this art work. Do not forget to ask him for your lucky words. 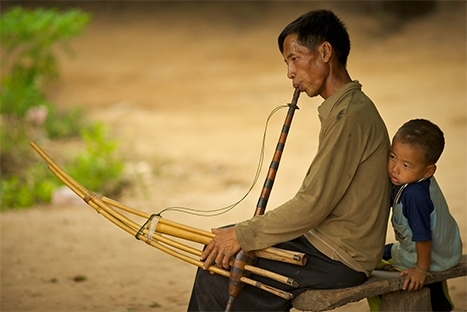 You will continue to visit the fascinating museum – the Vietnam Museum of Ethnology. This place is a research center and a public museum exhibiting the 54 ethnic groups of Vietnam. At the end of the afternoon visit Hanoi’s Old Quarter also known as “the 36 streets”. Take a walking tour through charming Hang Be Market and around gorgeous Hoan Kiem Lake. This bustling area of narrow streets and alleys is home to literally thousands of small businesses and shopkeepers. Do not forget to bring some hand-made gifts from this city to your beloved ones at home. Back to your hotel and be on your own for the rest of the day. Depart at 7.30 a.m from your hotel to ride directly to Cuc Phuong National Park. First, we visit the Endangered Primates Rescue Center. Have lunch at Cuc Phuong Guest house and check in. In the afternoon, visit the flora, fauna and one-thousand-year-old sequoia tree, and the cave of Prehistoric man in Cuc Phuong National Park. Dinner and overnight at Cuc Phuong National Park. After breakfast, we leave the Cuc Phuong to Ha Long bay, a World Heritage Area of outstanding natural beauty. Upon arrival, transfer to a junk for a cruise around Ha Long Bay with a delicious local seafood lunch served on board. The cruise passes by many rocks and islets in many funny shapes. Time for kayaking challenging. Again your dinner served on board. In the evening, enjoy the night fishing (optional) and later overnight on board. In the morning, your breakfast or brunch will be served while doing further cruise to explore the beauties of the Bay before returning to the Wharf. Disembark around 10:30-11.00am. On return, before heading to Noibai airport we take a short stop at Phu Lang Pottery village or Dong Ho Village (traditional painting village). Arriving in Danang, you will be greeted by our guide and transferred to Hoi An for hotel check-in. Overnight in Hoi An. Depart at your hotel at 9:00, you will ride a bicycle to Tra Que Vegetable village, experience a day of living and working with the local farmers in this village. A tour of the organic vegetable and herb gardens can include sometime working in the field if you like, or merely observing and learning about the system and the fresh ingredients. Upon returning to the house, we were all treated to an herbal foot massage followed by a session of cooking various local dishes such as: Tam Huu Springroll, Banh Xeo or the local pancake of the people from the middle region. Biking back to your hotel. Overnight in Ho Chi Minh City. A free day in Hoi An for beach relaxing! Overnight in Hoi An. Board a morning flight o Ho Chi Minh City today. Upon arrival, depart for the drive to Cu Chi. Leaving the city behind, the scenery changes to views of rice paddies, villagers drying noodles by the side of the road and other scenes typical to southern Vietnam. Arrive and start the visit of the famous Cu Chi Tunnels which consist of an incredible underground tunnel network constructed by Vietnamese resistance fighters (Viet Cong) during both the French and American wars (children can enter the tunnels which have been widened allowing easy access). In the late morning journey back to Ho Chi Minh City for lunch at a popular BBQ restaurant for a ‘grill your own lunch’. Leave the centre of the city for Cholon, the Chinese quarter where a cyclo ride will be taken through the buzzing streets. At the end of the afternoon indulge the kids with surprise and delight from a special musical performance in the intimate confines of a converted living room, known as Truc Mai House, which belongs to a couple of Vietnam’s most accomplished exponents of traditional Vietnamese music. At the end of the performance participation is welcome to try and master these ingenious, handmade instruments. Following the performance drive back to your hotel. You will be free to explore the city by yourself. Overnight in Ho Chi Minh City. Early departure required at 7:30AM. Arrive in the town of My Tho where you will take a boat trip over the Tien River to Ben Tre Island. As you cross over the river (a branch of the Mekong) you will pass sand barges and small sampan fishing boats, an insight into daily life on the Mekong Delta. Half way across the river you will stop at Phoenix Islet where you will encounter local families making coconut rice paper as well as handicrafts made from coconut shells. From here continue to Tan Thach where you’ll pick up your bicycle and begin your 8-km ride through the coconut groves and remote villages, along the way observing the simplicity of life on the Mekong. Stop for a traditional style Vietnamese lunch by a tiny tributary of the Tien River. After your meal take a leisurely boat trip passing by an eclectic mix of Mekong style boats laden with sand, fruit, fish, coconuts – this is as close as it comes to life on the river. Delve back in time stopping at the small family run cottage industries that trade in coconuts, as well as traditional salt making workshop, a grass mat weaving hamlet and a brick kiln factory. Continue by driver to Mo Cay district, from here cross over a tributary of the Mekong by local ferry before arriving at your homestay located on Long Island which is renowned for its fruit orchards and sedge fields (this grass is used to make traditional mats). The homestay is unique and the only one to be found on this Delta Island and you will be made to feel as a member of the family. In the late afternoon you will have a chance to practice making banh xeo – a type of savory pancake and a specialty of the Mekong region. After dinner, spend time with the family to learn more on their life, culture as well as the history of this Island. Wake up to the sound of the countryside. After breakfast start exploring the island by bicycle (or on foot) through the village to sedge fields, here see the cutting and weaving of this grass which is used to make traditional mats. En-route visit a shrine dedicated to Thoai Ngoc Hau who was one of the founders of the area. At then end of the morning return to the house for lunch before taking the ferry back to Vung Liem to visit a Khmer pagoda which dates back to 1377. Continue to Vinh Long city, en-route see the vast expanses of rice fields, and if you are lucky the local farmers harvesting their crop. In Vinh Long visit the local market, this is an excellent place to take photographs and a huge array of fresh produce is on offer. End the tour and start the drive back to Ho Chi Minh City where you will arrive in the late afternoon. You will be free today in Ho Chi Minh City until being transferred to the airport for a flight to Siem Reap. Upon arrival, our car and guide will pick you up at the airport then transfer to hotel for check in. Dinner at local restaurant with Apsara Dance show. Overnight in Siem Reap. We start on our bike and cycle (45 minutes for cycling) or drive to the world heritage areas on the roads less travelled. Ride among the jungle passing local village and local shop. It’s a very special and acting day as you will explore some of Angkor’s most beautiful temples. You will visit the West Gate of Angkor Thom – undiscovered by mass tourist. 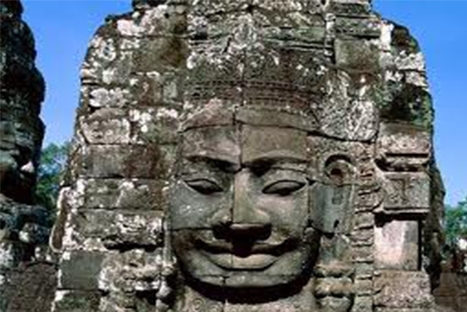 The Ancient capital of Angkor Thom (12th century), see the South Gate, Bayon temple-unique for its 54 towers decorated with over 200 smiling faces of Avolokitesvara. Baphuon temple lying just to the north of Bayon a pyramidal representation of mythical Mont Meru, the Royal Enclosure, Phimeanakas, The Elephant Terrace and the Terrace of the Leper King. In the afternoon, we visit the famous temple: Angkor Wat. 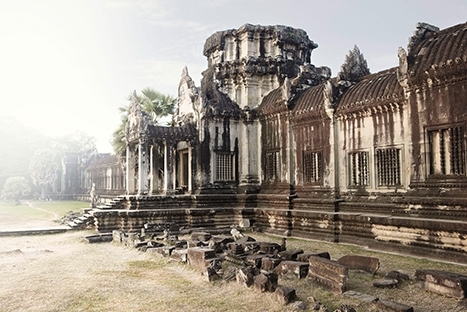 Angkor Wat is a World Heritage Site since 1992, famous for its beauty and splendor. Angkor Wat features the longest continuous bas-relief in the world, which runs along the outer gallery walls and narrates stories from Hindu mythology, visit Bakheng Temple and enjoy a romantic sunset view from Bakheng Hill. Enjoy 1 hour foot massage before transfer to your hotel. Overnight in Siem Reap. Early morning we start witness sunrise over Angkor Wat temple and listening singing birds over the ancient land of Angkor area. About 6:45am, we walk to nearby pagoda and offering food to monks. After monks finishes their breakfast, we start enjoy our breakfast box on the ground floor of pagoda, jasmine tea will be served in the peaceful atmosphere of pagoda. Transfer to the Tonle Sap for a cruise on the lake with the visiting to floating village to explore the fishermen life. Then visit Chantier Ecole-Artisant d’Angkor. You will be free for the remainder of the day. Overnight in Siem Reap. You will be free today until being transferred to the airport for your departure flights.